Welcome back, my DIY bathroom renovators! We’ve all heard the saying “diamonds are a girl’s best friend,” right? Well you know what isn’t their best friend? White fixtures and white walls. Does this sound like we’re describing your bathroom? Before you toss the bath towel in decorating frustration, Cutting Edge Stencils is here to help. After all, stencils can help liven up that dull space. 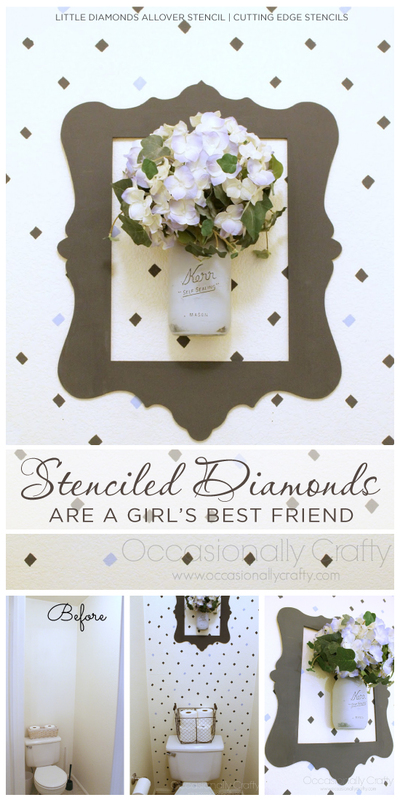 Stenciling is easy, inexpensive and completely customizable to your decorating needs. 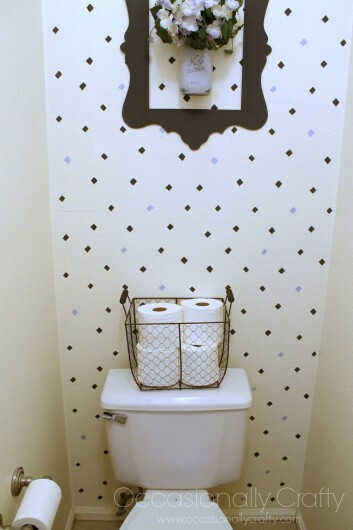 Today we have a bathroom refresh that uses our new Little Diamond Allover Stencil. Come take a look! 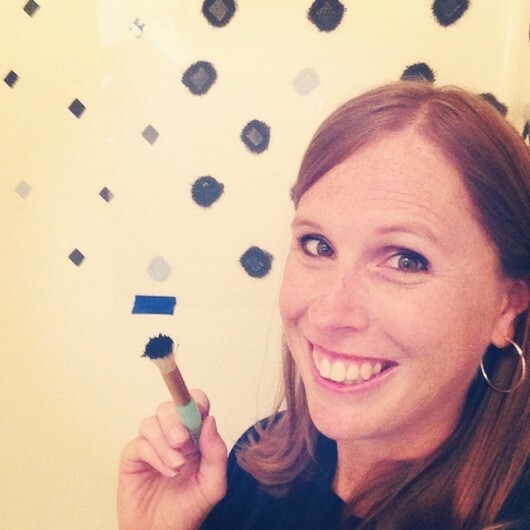 We’d like to welcome Valerie, the creative DIYer behind the blog Occasionally Crafty. Valerie admits that her master bedroom and bathroom have an extremely odd layout. The bathroom is adjacent to the master bedroom, but there is no door between the two rooms. Then within the bathroom, there is a small room for the toilet. Here is a shot of that space before its makeover. 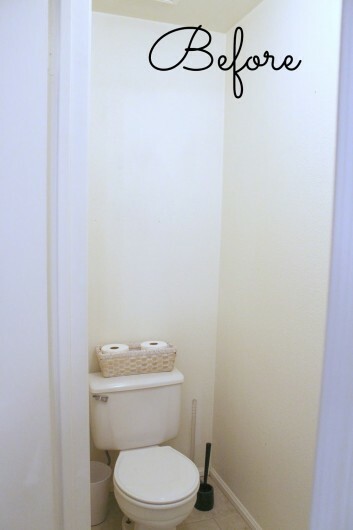 Valerie says, “I have done basically nothing for my little toilet room except put a little cabinet to hold any necessary items you might need while in there. But, I have been longing to pretty it up for a while now.” Well what would you do if your space needed a little spicing up? Stencil it! That’s exactly what Valerie did. She fell in love with our Little Diamond Allover Stencil, one of our new geometric patterns.She used a spray adhesive along with painter’s tape to help hold the stencil in place. Then she painted the pretty diamond pattern in FolkArt’s Baby Blue and DecoArt’s Americana Chalky Finish paint in Relic using a stencil brush. Here’s a shot of her working through the stencil process. 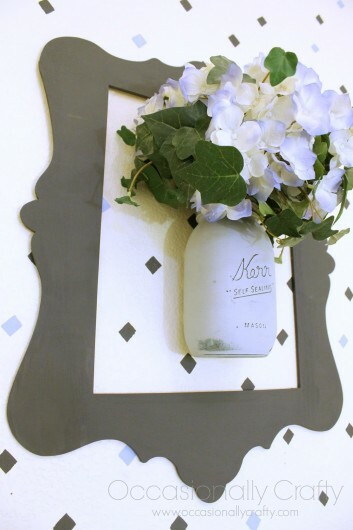 Once the Little Diamond pattern was painted on the wall, Valerie painted an 11″x14″ decorative frame in gray and added a distressed mason jar filled with hydrangeas to complete the space. Ready to see it? Valerie had this to say about her stenciled space, “when I pulled off the stencil to move it I was thrilled with how it looked.” We love this pretty patterned accent wall! Want to win a free stencil? Hop on over to her blog and enter the Cutting Edge Stencils giveaway! Tell us, where would you use the Little Diamonds Allover pattern? Leave us a comment below, we’d love to read your thoughts! Can’t get enough stencil fun? 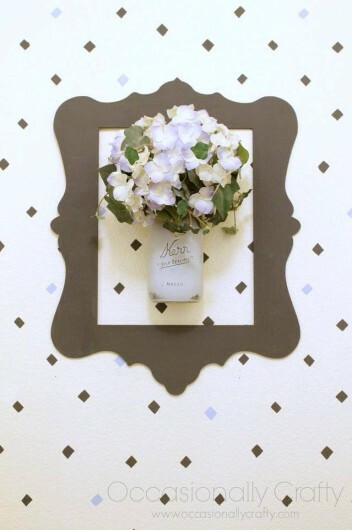 Shop our stencils and find the perfect one for your space! Follow us on Pinterest and Instagram to see awesome inspirational photos! Have you completed a stencil project? Come share it on Facebook! Thanks for reading, and happy stenciling! Stencil Pinterest Worthy Tile For Under $50! Tile Stencils Are The Best Kept DIY Secret!